A backlash is brewing against the growing armada of consumer drones overhead. Here come the drone hunters. Consumer drones are gaining air superiority over our homes, schools, beaches, and parks. Not everyone is thrilled. Get ready for the backlash. An entire anti-drone industry is emerging that will arm anti-drone people with anti-drone technology. These new tools will enable drone detection, tracking, identification, disabling, and even hacking and hijacking the drones as they fly. This burgeoning industry didn't just fall from the sky. Like so many of our favorite tech gadgets, anti-drone devices will be consumerized versions of professional military and industrial gear. The anti-drone idea started years ago with the military. And the big military contractors like Boeing, Lockheed Martin, Raytheon, Thales Group, Israel Aerospace Industries and Russia's United Instrument Manufacturing Corporation (which focuses on countering U.S.-made military drones) are happy to develop expensive, powerful anti-drone technologies. The U.S. Army is testing Raytheon's Phaser, a massive electromagnetic pulse (EMP) device that can shut down an entire drone swarm with a single blast. It's essentially a microwave radiation transmitter mounted on a 20-foot shipping container. I want one, but it's probably out of my league. The U.S. Marine Corps is working on a truck-mounted laser beam that kills smaller drones in flight. And the U.S. Air Force wants handheld drone-killing kits. Even as military contractors develop new tech to defeat drones large and small, the need for domestic, non-military, anti-drone tech is heating up. Prisons worldwide have a big drone problem. 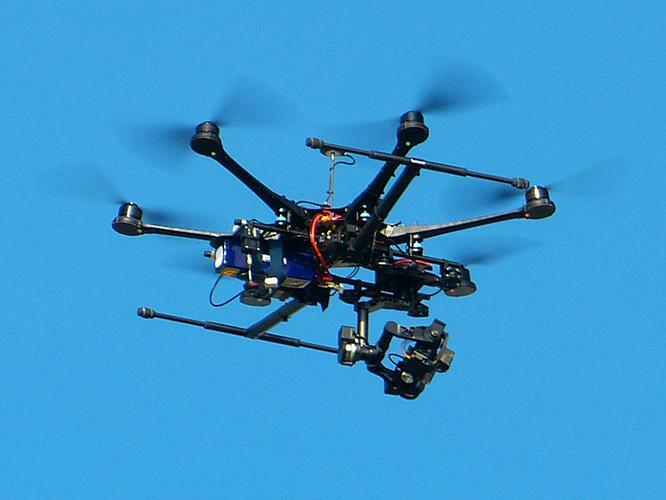 Accomplices on the outside are smuggling smartphones, drugs, and weapons using drones. The drone pilot wasn't caught. In fact, with prison drone smuggling, they rarely are. That's why The UK's Ministry of Justice wants drone-makers to hard-code prison locations into consumer drones to make prisons into no-fly zones. It's also why prisons around the world are weighing their options with anti-drone tech. Airports also have a drone problem. Although far less likely than bird strikes, drones are a growing concern. Airport drone strikes and near strikes are way up. The Dubai airport was closed three times this year because of drones. It recently deployed a "drone hunter," a drone that uses an infrared camera to identify drones near the airport. A small private airplane flying about four miles from the Dallas-Fort Worth International Airport last month spotted a drone flying at an incredible 4,000-feet altitude. FAA rules say that drones are not allowed to fly above 400 feet. Denver International Airport last month started testing "drone zappers" as part of a wider effort by the FAA to identify the best way for all major U.S. airports to deal with the drone menace. Drones have become such a central problem for airports that airplane makers are getting into the action. Companies like Airbus and Boeing are developing anti-drone technologies, presumably to be installed in the jets themselves. Unauthorized, unwanted or illegal drone flying is a growing problem all over the world. Celebrity-obsessed fans and paparazzi are increasingly buzzing movie and TV sets, such as The Game of Thrones set in Ireland. First responders are increasingly harassed and endangered by drones. Curious onlookers are using drones to check out fires, police standoffs and the damage caused by natural disasters. Such events involve fast-moving helicopters and other aircraft that are endangered by drones. Another problem is that drones make noise that can hamper search efforts. Other hotspots for drone trouble include ports, borders, power stations, and special events. All these scenarios and incidents are driving an explosion in anti-drone technologies. The fast-growing anti-drone industry involves wildly different approaches and technologies. One is the "space gun" approach, which uses special-purpose rifles designed to shoot a focused ray that jams all the frequencies that consumer drones use to communicate with their handheld controllers. The newest anti-drone "space gun" is DroneShield's DroneGun, demonstrated on video for the first time this week. Another is Battelle's DroneDefender. 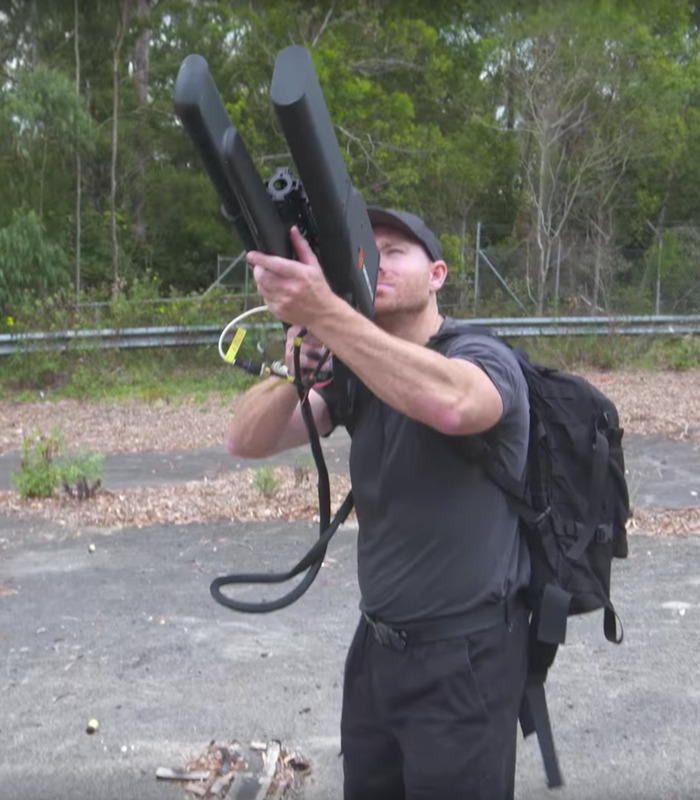 DroneShield's DroneGun looks like a space rifle, but it's really a silent drone disrupter. The signal jamming approach is one of the most common, and most of the products are ground-based rather than shoulder-fired. A company called Elbit systems unveiled last month its ReDrone system, which detects drones, then identifies them, tracks them like radar, then disrupts drones by interfering with the radio connection between drone and controller. ReDrone is a white dome mounted on a tripod with an antenna on top, and it communicates with a suitcase unit and color display. Unlike the "space gun" products, which have to be aimed precisely, ReDrone monitors in 360 degrees and can track and disable multiple drones at once. Another way to stop a drone is to throw a net over the drone to bring it down. These can be shoulder-fired nets, as with the Skywall 100, a bazooka that can bring down a drone from up to 100 yards away. It uses a computer-controlled targeting system that shows distance, and displays a green light when aim is correct. Theiss UAV Solutions' EXCIPIO also launches a net out of a cannon, but does so from another drone. This approach has a longer range than the cannon approach, but you get only one shot. Michigan Tech is also working on a "Drone-Catcher" system involving a drone that shoots a net to capture another drone. Malou Tech has demonstrated its Drone Interceptor system that hangs a net from the bottom of a drone. You catch the other drone by flying over it. The spinning rotors get tangled in the net, and the drone can be carried back to the operator. Another approach is to hack drones. The hilariously named security company Pwnie Express claims to have developed the first drone malware. First introduced in January and called Maldrone, Pwnie Express uses Wi-Fi to infect other drones with a payload that, among other things, disables the autopilot, causing the drone to fall out of the sky. The company demonstrated this being delivered from another drone. A company called Department 13, funded by the Pentagon's Defense Advanced Research Projects Agency (DARPA), hacks drones by injecting packets of code into the radio protocol used for communication between the drone and its handheld controller. When the product, called the Mesmer, successfully cracks a radio protocol, it can take command of the drone. Defeating drones by hacking them sounds like fun, and you can do it yourself. Make: magazine has posted step-by-step instructions on how to do it. Technology is great, but there's always Darwin's way. Security specialists in the UK, the Netherlands and France are training eagles to grab drones in mid-flight and carry them in their talons back to the handlers. All these technologies and methods were designed for professional use. But like so many of our favorite gadgets, some of them will surely be introduced to the consumer marketplace. If you think anti-drone tech for consumers sounds farfetched, you should know that apps for tracking drones already exist. Apps like DeTect's Drone Watcher App and Drone Detector Free are available now on the Google Play store. DroneWatcher is free, but it's on a freemium model. A full-featured version that includes a locator "beacon," crowdsourced coverage and a running history of drone detection will show up in the Play Store "after the first of the year," according to a DeTect representative. I think it's only a matter of time before consumer versions of products that actually disable, catch, or destroy drones come on the market. The biggest consumer anti-drone products might come from drone companies themselves. In other words, defense or self-defense against other drones might become an optional feature when you buy drones. I predict that drone hunting will become a popular hobby. The hobby will emerge like this: First, small businesses will emerge that specialize in capturing drones, and people who feel victimized by drones will hire them. Then, inevitably, we'll see two kinds of reality TV shows. The first will be like "Dog, the Bounty Hunter" but will focus on drones. They'll be called "Drone Hunter" or "Drone Busters." A second type will be an aerial version of "BattleBots" or "Robot Wars." Expect show names like "Drone Wars" or "Battle Drones," featuring either drone-to-drone dogfighting combat, or battles between drones and drone hunters on the ground. These shows will help mainstream drone hunting as both a profession and a hobby. If you love drones, buy a drone. But if you hate drones, just wait. Anti-drone tech is coming to the consumer marketplace. Happy hunting!